In collaboration with the Bank of Cyprus, Crowdpolicy implemented the API Developers Portal (https://bocapi.net/) to simulate and implement productive APIs based on the Open Banking standard and the APIs required for PSD2. The goal of this approach was the visual and functional integration of the Bank’s productive and Sandbox APIs with the support of value-added community activation services as well as the maturation of an API strategy. Additionally, the bocAPI (https://sandbox.bankofcyprus.com/) contributes to the development and creation of new applications which will provide new experiences in banking transactions in the future. A direct answer on behalf of the Bank to the questions and demands of the community and those interested in experimenting or using the productive APIs. The creation of a new service – infrastructure of the Bank for the business ecosystem, startups and developers. Bank innovation with technological implementations of infrastructures for the business ecosystem around Fintech in the context of the broader trends around API economy. The overall approach for the project implementation could support the maturation of necessary actions and PSD2 planning strategy. The maturation of an API Strategy along with the additional goal of creating an ecosystem and the future implementation of an app – fintech marketplace. Maturation of the strategic implementation of productive – legacy APIs. The API Developers Portal is used by more than 140 developers and it was also used during the BoC Hackathon (http://bochackathon.com/2017/) held by the Bank of Cyprus. 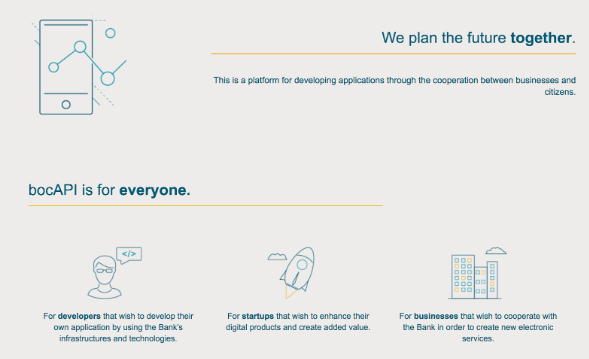 Through bocAPI (https://developer.bankofcyprus.com/), developers and anyone interested can experiment with the Bank’s testing infrastructures and technologies that cover the entire range of transactions. It is used to gain access to Bank of Cyprus customers’ accounts via OAuth2 and, then, to access an API account and payment. It is used to gain access to account data of Bank of Cyprus customers who have authorized it. Accessible information includes the account number, IBAN, account name, type, available balance and transaction history. It is used to execute any payment action between two Bank of Cyprus accounts or one of the Bank’s accounts and another institution via SEPA / SWIFT. It is used to obtain the access token, which is a prerequisite for accessing all other APIs. It is used for business purposes, such as the execution of mass / multiple payments between Bank of Cyprus accounts or other institutions’ accounts. They are used to perform support procedures. 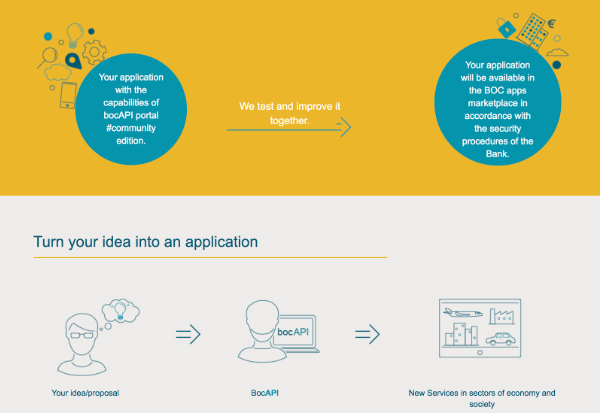 Find out more about bocAPI and its documentation at https://developer.bankofcyprus.com/.